Pro Tip: Start here to help make sense of what follows. In my previous post, one reason I was so concerned with verifying the authenticity of an (apparently) authentic music loop source was to provide a bedrock, base layer of reliable information. Thanks to years of speculation and misinformation, the waters have been muddied consistently on the subject of Main Street music, resulting in reconstructions based on false information and guessing and rumors. Once we do know what played at a certain place at a certain time, we at least have a concrete set of data to base our speculations on, as we will be doing in this very post. Today the question revolves around whether or not Main Street USA at Magic Kingdom in Florida had two different background music loops, and what this means. It's been assumed for years that Main Street had two different music loops, one for morning and one for evening, although it's impossible to guess where this information originally comes from. Slightly corroborating this idea, for many years Disneyland Paris' Main Street had an AM and PM loop, that park's Main Street being very closely based on the Magic Kingdom version. But information about the elusive PM loop remained obscure. When I began researching Main Street music, there was one primary source for obscure background music information: Utilidors Audio Broadcasting, which is very good at posting files which circulate in the darkest corners of the collector's circuits. One file they hosted split into several parts was labeled "Magic Kingdom 1972", which turned out to be identified as the Main Street BGM at Disneyland and Magic Kingdom 1976-1991, as established in my previous post and hereto called the "AM Loop". UAB also hosts this same AM loop, split into single songs, under the title "Disneyland Main Street Area Music (Uncertain Vintage)". It will take a Disneyland specialist to determine what exactly played at that park and when, although in my opinion the 1976 Main Street loop would've been installed at both theme parks in the same year. UAB hosts yet another BGM identified as Main Street music, which they associate with Disneyland and the years 1969 - 1975. It is very similar to the AM Loop, but has many distinct differences, and was identified and compiled by Michael Sweeney based on the UAB copy. 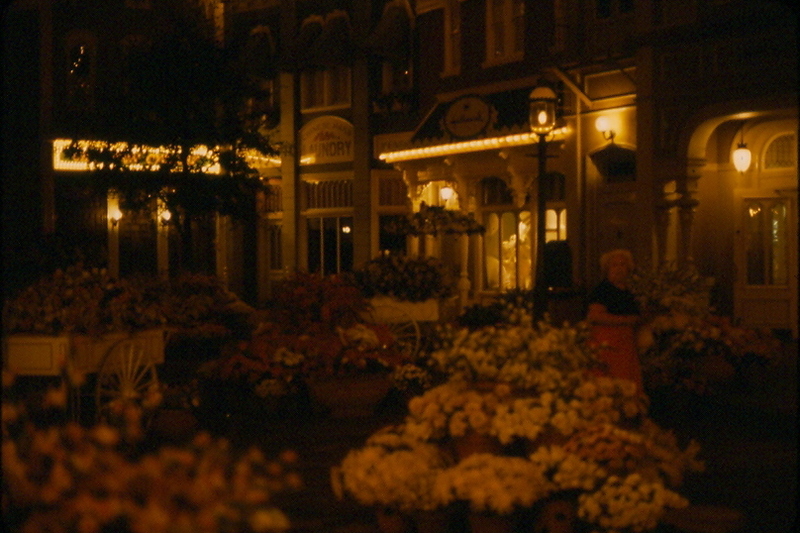 This mysterious second loop "Disneyland 1969-1975" is our subject today. 1) It's made up of different tracks from albums used to compile the "AM Loop"
Just as identified in the AM Loop, four albums form the backbone of the loop: the Gaslight Orchestra's Gay Ninties Waltzes, 30 Barbary Coast Favorites, and two Albert White albums, Your Father's Moustache Volumes 1 and 2 (published by the Barbary Coast label). Confusingly, Albert White also published two other albums on the Fantasy record label, also called "Your Father's Moustache" but made up of different songs and recordings. Both of these albums - one of World War I songs called "Over There" and another billed "Your Father's Moustache in Hi-Fi" - are used in this "1969" loop. Even further complicating matters, a few tracks used in the "AM Loop" also repeat here - "Good Old Timers" and "Silver Heels". All of this helps to convince me that Jack Wagner compiled both of these loops at the same time, starting with the "AM Loop" and proceeding to this one. Having finished the AM loop, he seems to have had trouble with the "1969" loop, perhaps looking to find more music like the Gaslight Orchestra and Albert White albums, only to find two more Albert White albums of different material. Those of us who research background music can imagine his frustration. This implies that the label "1969-1975" is obviously false. 1969 predates Wagner's involvement with Disney in selecting BGM loops, and given that this particular loop, if it is authentic, has Wagner's fingerprints all over it, it has to at least be 1970-1971. Allowing that it seems to be produced at the same time as the "AM Loop", I'm comfortable assigning this loop to the same 1976 time period. If you own the Albert White albums proper, you know that listening to them in album order is a pretty frustrating experience. White jumps wildly from jazzy, wildly embellished standards to beautifully stately arrangements. What we can say about this mystery loop is that most of the Albert White pieces on it are of the much jazzier variety, and the loop overall pulls much more heavily from the honky-tonk 30 Barbary Coast Favorites album. Largely, the "AM Loop" gets the stately, slow, dreamy tracks and this mystery loop gets the crazier jazz-era stuff. This is crucially important because this implies design intent, and design intent is what we are looking for here. If Wagner was looking for more jazz-era material from Albert White, this helps explain why he suddenly introduces tracks from two extra albums, almost as if he got frustrated and went back to the record shop. Similarly, it's as easy to imagine Wagner needing just a few more tracks to round out the "AM Loop", leading him to think of music from his private record collection that fit the mood. This could explain why the tracks from "Donnybrook!" and the "Theme from Minnie's Boys" - both musical Broadway productions - ended up in the AM Loop. All three of the "Broadway" tracks appear one after another in the AM Loop, further implying that they were decided on all at once after Jack reached an impasse. But what does the differing character of the two loops mean? Well, it could be that one was intended for Disneyland and the other for Walt Disney World, but this seems unlikely to me. Although the two areas are aesthetically unique, they're tonally similar enough to make me think that Wagner wouldn't have bothered. We also know that the "AM Loop" played at Magic Kingdom most of the time and at Disneyland around the same time, leading me to conclude that this loop was compiled with something slightly different in mind. It could be that the slower, more stately music is intended to cause pedestrians to slow down, admire the scenery, and just maybe... shop? Similarly, the jazz music at night, which is frankly very appropriate to the visual of Main Street's twinkling lights, could've been intended to get pedestrians up and stepping quickly, helping clear the park at the end of the day and keeping crowd circulating during the parade and fireworks. Was the "mystery loop" intended to help crowd flow during the popular Main Street Electrical Parade? It's not as far fetched as it sounds, Wagner produced the music for the parade as well. The Electrical Parade returned in 1976 at Magic Kingdom and Disneyland following the final run of America on Parade, lending possible credence to a 1976 date. The date, Wagner's fingerprints, and the design intent apparent in the resulting work itself convince me that this "mystery loop" is the legendary "PM Loop" for Magic Kingdom's Main Street, USA. In an absolutely ideal situation, this loop would've been rebuilt from a live recording, but as it is it's been remarkably difficult to find evidence of this loop actually playing in park. Unlike the AM Loop, which everyone remembers, the "PM Loop" seems to have played only occasionally. As it happens, I've come across some helpful clues on YouTube. Here is a 1982 home video where "Geraldine", a song occurring in the PM Loop but not the AM Loop, can be heard starting at 1:24. Disconcertingly, this video was shot not at night, but in the early morning. Thankfully, more concrete proof can be heard in this video from 1990, starting around 1:40, several continuous minutes of the PM Loop - at night - can be heard, starting with "Man on the Flying Trapeze" and continuing through "At A Georgia Camp Meeting", "Smokey Mokes", "Ida", and "Good Old Timers". This exactly matches the "PM Loop" gathered from UAB and pretty much fixes its probable authenticity. 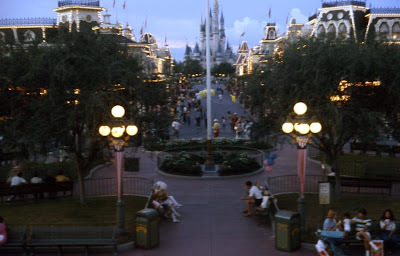 Best of all, if we backtrack to the first part of the home video, as the family enters the Magic Kingdom, an AM-only track - "Strolling Thru the Park / Mary" - can clearly be heard, establishing that these two distinct loops played alongside each other at least as recently as 1990. By 1990, Jack Wagner had effectively retired from Disney, and since this is almost certainly a Wagner loop created alongside his "AM Loop", the chances of my mid-70s date being accurate are very good. The question of why the PM loop is so obscure is harder to answer definitively, although it's not hard to guess. This was an era when theme park music was still run on 1" magnetic tapes and played out of speakers that were placed somewhat randomly around the park. EPCOT Center's BGM was far more sophisticated than Magic Kingdom's in that you could hear it almost everywhere and at consistent levels. 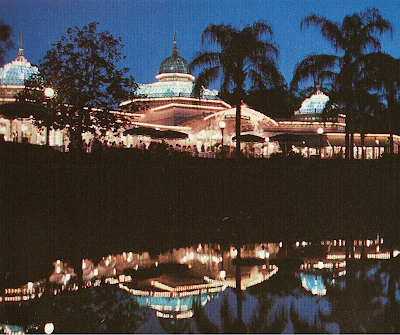 In 1990, Magic Kingdom was just on the cusp of a wideranging refresh of their area music delivery system, switching to CD playback as well as replacing many vintage Wagner tracks with more modern loops from Tokyo and Paris. This really just means that Magic Kingdom's system was low tech. Very low tech. 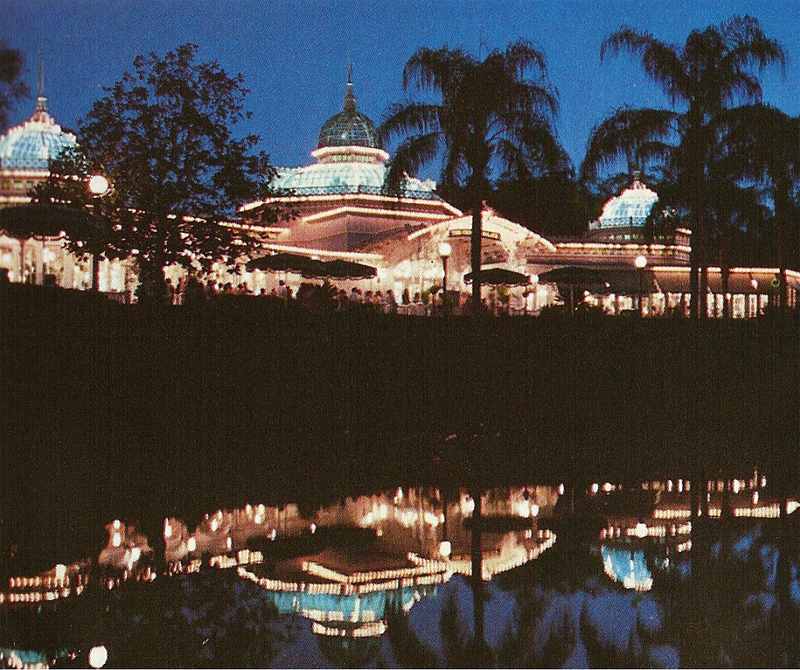 By 1990, it was basically antiquiated compared to new systems in place at EPCOT Center, Tokyo Disneyland and Disney-MGM Studios. It's highly, highly doubtful that Disney synchronized two 1" magnetic tape machines to a clock just to play different pieces of music on Main Street at day and night back in 1976. This means that the playback probably had to be manually switched, perhaps by a Maintainence guy or a Parade tech. If we assume that human error was just as likely to forget to switch the BGM as not, and sometimes forget to switch it back in the morning, then the obscurity of the loop and the fact that we have some evidence that it sometimes played at times when it wasn't supposed to becomes less mysterious. As a result of all of the preceeding, I'm comfortable labeling the "Disneyland 1969-1975" Main Street music loop sourced from UAB as being the authentic Magic Kingdom Main Street USA PM Loop. But now you're part of this thing, too, so listen to the music, look at the evidence, and make up your own mind. Compiled by and thanks to Michael Sweeney. For what it's worth, I can precise that Disneyland Paris has always had (and still has) its two loops, although they've slightly changed over the years. Originally, the distinction between the two was exactly as you described above: a calmer loop for the morning and a more "exciting" loop for the evening. It would be very likely that Eddie Sotto and his team used the Wagner loops as a model. Brilliant stuff, thanks! I love knowing the nitty-gritty details behind the loops. Do you know when they added "Put on your Sunday Clothes" and "Surrey with the fringe on top"? Those were in for as long as I can remember at Disneyland. 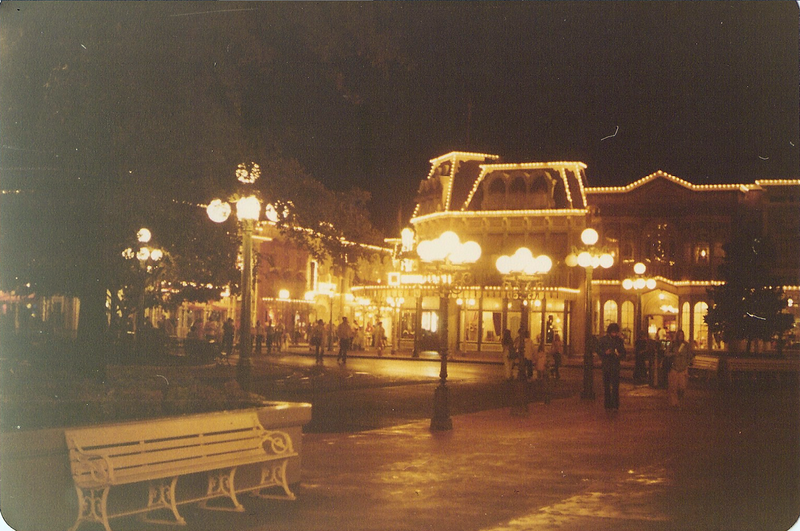 Oh, and a slight correction - The Main Street Electrical Parade - V2 - opened at both parks in 1977, not 1976. In 1975 & 76 America On Parade was running. Most of the new Electrical Parade was in fact made out of remodeled AOP floats. This is really spectacular stuff, I had just regained interest in this old loop after downloading three Gaslight orchestra LP's that are now in just 2 itunes downloads, it looks like i'll have a few more songs to track down now! numbers 2, 5, and 6 are available as digital downloads in iTunes, in fact 5 and 6 are repackaged as a single (33 track!) album (Albert White and his Gaslight orchestra - alexanders Ragtime Band), that was too good a deal to pass up, does anyone know if any of the other albums are available as either CD's or downloads?